There's another version. They tell you that it's free but you gotta sign up with your credit card. If you don't like it within a limited period of time, they will give you a refund. If this was my business, I wouldn't let my brand be tarnished by such methods. It leaves a bad taste in the mouth. And people can (and will) post about it on their Facebook wall. You don't want to go down that road. I got this 'Free offer' from my email inbox. I have a moneybookers account and they send me junk mail now and then. 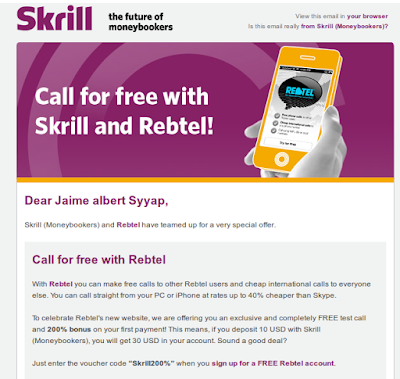 Moneybookers is now changing their brand to Skrill. I have no idea what the reason behind is, but from a social media communications perspective, it's a poor decision. Why? They did not even specify what makes them different from paypal. Moneybookers simply announced that they are changing their brand name to Skrill--it's not even a catchy name. I am assuming there was a change in whoever is in charge of moneybookers. What usually follows is a major revamp in its marketing, putting the new management's stamp on everything that's going to happen next. If I am going to claim that something is for FREE, then there should not be any strings attached. Try it free for 30-days is good, but still, it's not entirely free. If I am going to use the 30-day free offer, then I am going to have to explicitly tell people upfront. It's that issue of trust. Never underestimates their BS radar. Thanks to the internet, people can sniff out BS half a world away. Invest into building that trust. It will pay you back a thousand fold in the long run. Now, if I was moneybookers, how will I fix this? First, learn from my mistakes. What went wrong? How come paypal is still around? If you did a search, you will find a lot of people complaining about paypal. There's opportunity there. Why didn't moneybookers pick up on it? That would have been a niche they could build upon. Moneybookers failed to topple paypal because they did not address the issue of perception. In people's mind, when it comes to online payments, the brand is paypal. It's not perfect, but no one else offers an alternative. Moneybookers wasn't really an alternative. They offered the same service, the same fees, everything else that paypal had, moneybookers had them as well--except for the brand name. If I were moneybookers, I'd tell everyone why moneybookers is way much different from paypal, and why they should choose us instead. This means I am going to give people something entirely different from what paypal is offering. I don't know what that is. Moneybookers probably has the answer to that.